The last 7 days report gives you an overview of your latest customer service activities. It is a good starting point for a weekly evaluation of your support. First off, you get the information about the number of chats and tickets you got. The report lets you know how many chats/tickets you got every day. This metric will help you to gauge how busy your LiveChat is, which is useful when you consider hiring another agent. You can click on any of the metrics from the Last 7 days report to get more detailed information. For example, clicking on the bar representing chats from Monday will show you all these chats in the Archives. Another metric useful for measuring your staffing needs is the number of queued visitors. Generally, the larger the number, the more you need another agent to handle the overflowing chats. The Staffing prediction report (available in the Business plan) is another tool that will help you with your staffing. First response time for tickets shows you how effective your team is at solving the more difficult cases that can’t be handled in one touch. You should aim to bring this metric as low as possible. Even if you can’t handle the case immediately, it is much better to reply quickly and reassure the client than to wait with a reply until you get a solution. The goals number and the number of solved tickets will show you how many of your chats/tickets have been closed successfully. The goals you can setup relate to certain actions you would like your visitors to take after a chat like a sale, subscription etc. 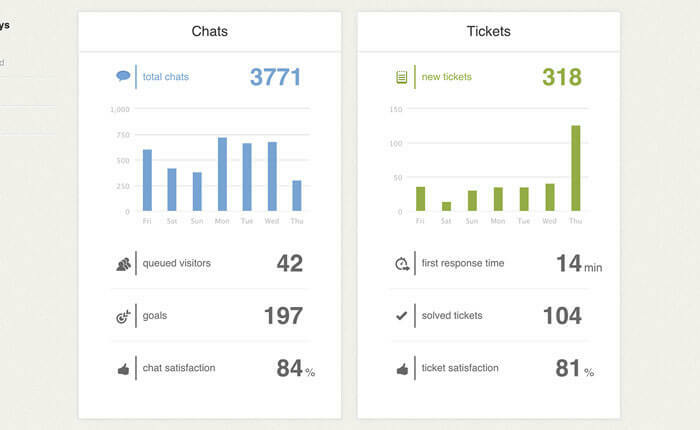 The last two figures show the customer satisfaction for chats and tickets. Customer satisfaction is one of the most telling metrics. It is the effect of all your customer service efforts as it shows how happy your customers are with your service. Make sure it is as high as possible. For more in-depth look at you customer service, you can check out individual reports. You can also use the export feature to track even more metrics.